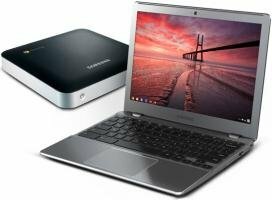 Google and Samsung revealed a new line of Chrome OS based computers, you can check out the full specifications of these systems at X-bit Labs. Pricing ranges from $329.99 for the desktop and $449.99 to $549.99 for the laptops. “This next-generation hardware from Samsung based on Intel processors and hardware-accelerated software delivers nearly three times the performance of the first-generation Chromebooks. With a new, app-centric user interface rolling out today and thousands of available web apps, we couldn’t be more excited about this evolution,” said Caesar Sengupta, director of product management at Google. The Samsung series 5 Chromebook is based on Intel Celeron 867 dual-core (1.30GHz) processor with integrated Intel HD Graphics 3000 accelerator and sports 16GB SSD and 4GB of DDR3 memory. The Samsung series 3 Chromebox is powered by Intel Celeron B830 dual-core processor with HD Graphics 3000 media accelerator, features a 16GB SSD and 4GB of RAM. Both the Series 5 Chromebook and Series 3 Chromebox feature Samsung’s renowned, sleek design identity.